Abstract: This course will discuss questions about the structure of time, including the prospects for a discrete theory of time, as well as different forms of infinite divisibility time might have. It will also discuss problems and prospects for theories of temporal parts of objects in time. Time is also intimately linked to causation. 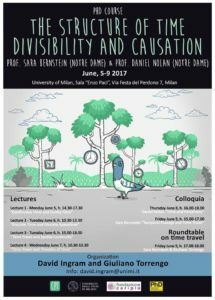 The course will examine what causal structures are allowed by the structure of time, and what role a theory of causation should have in a theory of time.